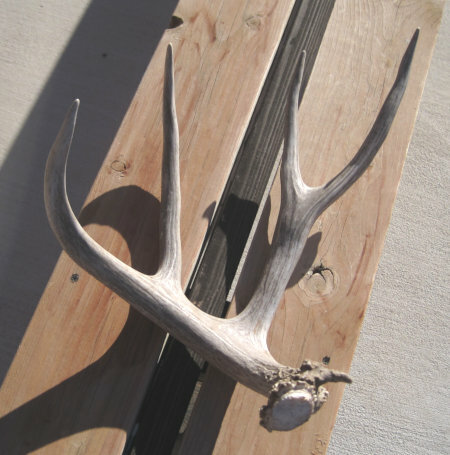 We see mule deer often enough that I've wondered if we would ever find a shed antler in the yard. A couple of days ago Dave found one. It's just a 4-pointer, but it's a big 4-pointer. We're still hoping its mate might be somewhere nearby, but no luck so far. It feels enormously heavy, though the scale says it's just shy of two pounds. Still, carrying around four pounds on your head all the time ... sounds like a recipe for a headache. The day after the antler turned up, five bucks visited our garden in the evening. Four of them still had substantial buttons where antlers had recently been. The fifth still had antlers (a ten-pointer). I have to wonder, what do they think about that? Is the guy who still has antlers the macho king of the yard? Or are the other four saying "Gosh, I'm so glad mine dropped last week, so sorry you still have to carry that rack around"?